Tunisian soldiers fired in the air to break up clashes between hundreds of young people in the southern town of Gafsa on Wednesday, residents and local media said. Authorities later imposed a night curfew on the town, Tunisian national radio reported. “Clashes broke out in Souk Fajr and Hay Nour. Security forces fired tear gas during clashes between hundreds of youths who used knives and swords,” Karim Ben Saleh, a local resident, told Reuters by telephone. 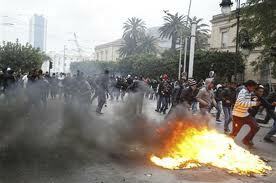 The Tunisian state news agency said the army fired shots in the air to disperse youths. The cause of the clashes in the city, about 300 km (186 miles) south of Tunis, was not clear and government officials were not immediately reachable for comment. “Shops have been closed and the city is completely empty. People have returned to their homes because they are afraid,” said Ben Saleh. Widespread protests in Tunisia six months ago forced out President Zine el Abidine Ben Ali after 23 years in power, sparking the Arab Spring which led to revolution quickly spreading to Egypt, Yemen, Libya, Bahrain and Syria. Disturbances and demonstrations have continued in Tunisia, illustrating continued political instability and the failure of the revolution to meet the expectations of many Tunisians. In a speech in Tunis earlier on Wednesday, the prime minister said he was confident the revolutions shaking other parts of the Arab world would succeed. “If this does not happen today, it may be tomorrow,” interim Prime Minister Beji Caid Sebsi said in a speech. Sebsi said Tunisia could not intervene in the conflict in neighbouring Libya despite a request from the Libyan rebels and representatives of the Gaddafi government. “Tunisia has enough of its own problems to solve,” he said.